In my family growing up, my mother cooked for the majority of the time, until she didn’t. She herself had grown up on casseroles, and subsequently hated them, so every meal was made of three separate food groups: a protein, a vegetable, a starch. She was primarily Italian, so the big, more elaborate guns like lasagna and stuffed shells were reserved for holidays and company. She was a fine cook, but as I’ve pointed out, a truly gifted baker. Then my father realized that cooking was more fun than having to clean up the kitchen, so when my mother became busy with grad school, their positions swapped. He especially liked to host for large groups of people so he could hear the accolades about his specialties, like the deep-dish pizza he made in a cast-iron skillet that I will spend the rest of my life trying to master. Other creations weren’t quite as group-friendly (ox-tail soup was in rotation far more often than I would have liked), but the message was clear in my childhood home that being a good cook and dinner party host was a goal to strive for. I’m kind of shocked now to see that the same scenario has played out in my own home decades later. I absorbed my mother’s stuffed shells recipe, but that’s where our similarities in cooking differ. Mainly because I love casseroles. I swear this is the last time I’ll mention how I loved to make my kids’ baby food, but as they got older, introducing them to regular food seemed like the biggest job I had, as important as reading them countless board books every day. Why else would I go to elaborate lengths like making a red pepper sail in their tuna salad “boat,” or creating individualized shepherd’s pies in little ramekins? With my love of casseroles and church lady cookbooks in full effect, I used more ground beef than Carol Brady. Stroganoff, tacos, meatloaf, beef pot pie. When people came to dinner, I favored ease over anything else, like Ina Garten’s beef bourguignon in a crockpot, or a winter meal with both slow-cooker chili and a batch of my favorite church-lady corn chowder. My husband didn’t seem to take much interest in the kitchen, although occasionally he’d pull out the one of two dishes he made for me while we were dating: pasta primavera and chicken breasts stuffed with peppers and cheese. 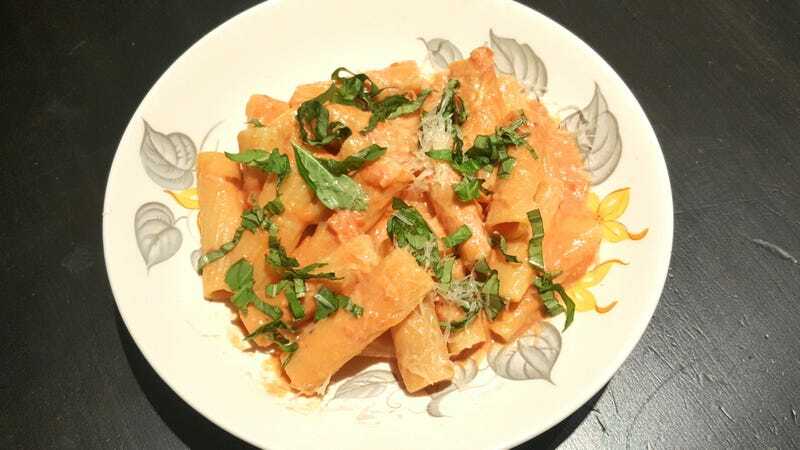 The early days were a bit of a trial for all of us; dinners would feature a pasta with either a red sauce with chunks of smoked sausage in it, or a white sauce that curdled because he had failed the pull off the roux. Soon, though, my husband (let’s just call him Brian, for that is his name) started straight-up surpassing my taco casserole efforts. He did this with the methodical persistence of a lab worker, honing his orange chicken recipe with marmalade until it came out better than takeout. Same with his Mongolian beef. He brought his butter chicken to the owner of our favorite local Indian restaurant to get an expert opinion. He mastered the five mother sauces and requested mole powder from a friend’s Mexican in-laws. He took over Christmas dinner, which I of course would have made casserole-heavy; while the mass murder of a family of lobsters in our dining room wasn’t the most idyllic way to spend Christmas Eve last month, I have to admit that the labor-intensive Christmas Day lobster bisque was pretty spectacular. Still, there’s a mild ribbon of resentment—and I wonder if my mother felt this too?—over the fact that my domain has been usurped. Now when I make dinner it is novel enough to be remarked upon, and even met with some trepidation by the kids, who have no memory of the little shepherd’s pies in ramekin cups. I fruitlessly try to remind them how I fed them three meals a day, for years—with two snacks!—poring over baby cookbooks and looking for the best recipes for our family. Those casseroles got tossed by the wayside in favor of Mongolian beef. And rightly so, it’s really good. Brian and I are striving just for what every family with kids strives for: A sit-down, homemade dinner that’s relatively easy. We’re not the family that jogs together on weekends, and we probably watch too many Fast And The Furious movies, but we do make time for home-cooked dinner most nights. I come home hopefully in time to join everyone at the table, and on a really successful evening we’ll have time to go over the high-lows of the day, or possibly play the “animal game” (a 20 questions brand of trying to guess certain species; I usually fail, but my son excels at this contest). It’s these moments that most resemble my own childhood, as my father saw taking children to restaurants as a total waste, and takeout dinners of neighborhood pizza or Kentucky Fried Chicken were rare. We still ate dinner together at the same small round table nearly every night. No, this is not my workaround to Dryuary; even though there’s not enough heat to really burn the alcohol off, it’s a very small amount. Still, the vodka adds a richness to a straight-up tomato sauce (as does the cream, obviously). This is a super easy pantry dinner (except for the cream); do not try to swap out the heavy cream for even half-and-half, however, as it will not work. Heat up the oil in a large sauce pan over medium heat, then sauté the garlic lightly. Add the tomatoes to the sauce pan with a good pinch of sugar (this helps balance the acidic qualities). Salt and pepper to taste, and let the tomatoes cook down for about 10 minutes, stirring occasionally. Meanwhile, put on the salted water to boil for the pasta. Add pasta once water is boiling and cook until al dente. When the pasta is done and tomatoes are cooked down, strain pasta and pour into large bowl. Then toss with tomato sauce. Then toss with the vodka. Then toss with the cream. Garnish with basil ribbons and good grated parmesan.